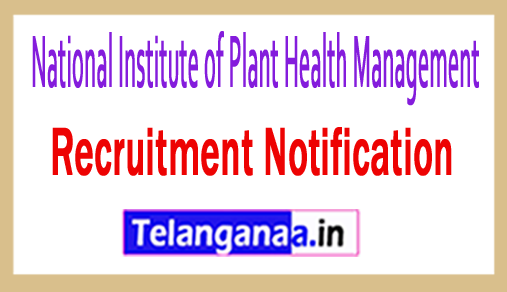 Advertisement for NIPHM recruitment to inform the best and qualified competitor for 07 advisers, Financial Advisor, LDC, stenographer has been advertised by the National Institute of Plant Health Management. Eligible participants can apply for NIPHM vacancy by submitting their prescribed application form by the last date of 30 days. Education Requirement: 10th / Bachelor Degree (Commerce) / Masters Degree (Organic Chemistry / Analytical Chemistry / Agriculture / Botany with Good Academic Record from well-Recognized Board / University / Institute according to applicable posts to Applicants ) Should complete the education as. Claimants should be between 18 to 27 years (5,6 posts). Candidates should not be more than 55 years (post 1), 45 years (post 2), 35 years (post 3), 28 years (post 4). Pay Scale: Following the qualification of the selection process, the contestant receiving the shortlist will be given Rs. 67,700 - 2,08,700 / - (post 1), Rs. 56,100 - 1,77,500 / - (post 2), Rs. 35,400 - 1,12,400 / - (post 3), Rs. 25,500 - 81,100 / - (post 4), Rs. 19, 9 00 - 63,200 / - (5 posts), Rs. According to organization norms, 18,000 - 56, 9 00 / - (6 posts). The first and most important step is to open the official site, which is http://www.niphm.gov.in. A list of this latest opening link will open and the candidates will have to select the most appropriate link, which will open the entire advertisement containing more information about NIPHM vacancies. Once the application is successfully filled, the applicant should send the application along with all relevant documents at the address given at the address given below. The last date for submission of application is: Within 30 days. Click NIPHM Recruitment Notification here.